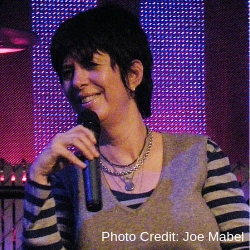 You might not know Diane Warren by name, but I’m willing to bet you have heard her songs — she has written or co-written nearly 2,000 songs registered with the Copyright Office. Warren wrote hits performed by Aerosmith, Chicago, Gloria Estefan, Celine Dion, Cher, Carrie Underwood, Michael Bolton, and Whitney Houston — just to name a few. Warren has been named ASCAP Songwriter of the Year six times and Billboard’s Songwriter of the Year four times. Her publishing company Realsongs, was named one of the top five music publishing corporations and is the most successful female-owned and operated business in the music industry. In 2001, Warren also received further recognition with a coveted star on the Hollywood Walk of Fame. Warren’s songs have transcended genre. Her number one Adult Contemporary hit “If You Asked Me To” has been recorded not only by Celine Dion, but also by R&B diva Patti LaBelle. Her song “Don’t Turn Around” has been recorded by eight different artists – from Tina Turner to Aswad to Ace of Base. Her number one pop hit “I Don’t Wanna Miss A Thing” performed by Aerosmith for the movie Armageddon not only received an Oscar nomination, but simultaneously hit number one on the country charts with a version by Mark Chestnut. Additionally, Diane’s song, “How Do I Live”, recorded by both Trisha Yearwood and LeAnn Rimes, was not only a #1 hit that won Yearwood the Grammy for Best Country Vocal Performance, but also carries the distinction of being the longest running song in the history of Billboard’s Hot 100 chart. Diane attended the 2019 Oscars for the 10th time as a nominee.